After using the Teltek Informer II BL "Glow" thermometer off-and-on for the last 10 months on my motorcycle, three things I can say without reservation: it reacts quickly; it's not bothered in the least by water, heat or cold; and, it's very large (31/8" W X 13/4" H X 17/16 D). The last trait isn't really a fault as the unit was designed primarily for heavy trucks, and may not bother you or you may have more room for mounting. 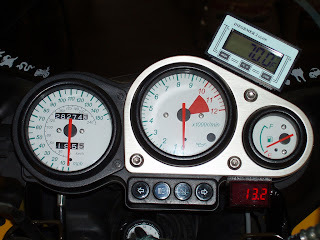 But for me, as good as this gauge is, its just too large to be a permanent fixture on my Kawasaki ZR-7S. Details: Teltek claims a range of -40° to 120° F and ± 1° F accuracy. The 1/2" LCD display reads in tenths of a degree and is behind a water resistant display window. There are four available variations on this basic Informer theme; the II Glow gets high/low temperature memory with one-button reset, and an always-lit soft green backlight (hence the "Glow"). Each unit comes with a 12' sensor cable, 3-way plastic mounting bracket and an AA cell to power the display. The cost is $65, and the temperature sensor wire can be special-ordered at shorter lengths for free (this isn't advertised -- call Teltek to request). The Informer I Glow deletes the temperature memory for $15 less. I've seen the Teltek Informer range referred to as "Glacier Chain" in various motorcycle forums, after one of Teltek's retailers. Bob Johnson, Teltek's very helpful president and founder, told me that Teltek uses a technology that enables the unit's backlight to operate for a year on one AA. In use, I got about 8 months on factory-installed "no-name" AA, still an incredibly long time. I chose a 3' sensor wire and probably could've gone as short as 1' as I ended up looping and zip-tying the excess. Bob advised that while the unit is very water-resistant, a dab of RTV to seal the area where the sensor wire exits the case wouldn't hurt. I didn't do that before I Dual-Loc'd the Teltek to the top of my ZR-7S' gauge cluster, but it may be desirable on a fully naked or adventure-touring motorcycle. I don't have the tools to accurately measure the thermometer, but it seemed accurate enough. While it's a rabbit compared to the turtle-like response of the Formotion I tested, it's still not quite as "instant" as the thermometer function of my old Kisan Chargeguard. 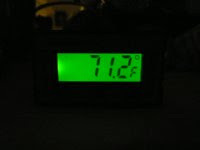 The LCD display is very easy to read, day and night, and easy on the eyes as well with no afterimages at night. The keypad buttons are all but impossible to operate with gloved hands, but again, this isn't a motorcycle-specific product, and really, how often would one need to mess with thermometer memory on the fly? (The backlight is always on so no button).